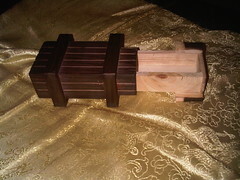 A couple of days ago I found a Wooden Puzzle Box on Firebox.com. It works on the same principle as a plastic version bought for me a few years back by a relative (I think it was bought from a Hawkins Bazaar). When you don’t know the answer it is fiendishly difficult to open. On Wednesday we were lucky enough to have John Archer come and lecture to us at the Thames Valley Magicians Guild. He is a very funny guy, and kept us all enthralled for a number of hours with his mix of comedy and magic. If you get the chance to see him lecture (or perform) I highly recommend it. Even as a fellow magician, I still managed to miss a number of deck switches, and even crib sheets attached to innocent objects. His take on the “tossed out” deck was well worth the cost of the lecture alone. Really I should stop praising him now in case he reads this and develops a big head.